Before they dream of being an astronaut or a superhero or of hitting a home run in the World Series, little boys dream of being the avenging cowboy hero, silently riding from town to town, endlessly travelling toward a red and setting sun and leaving only vanquished evil in their wake. They don a white hat and maybe a plastic facsimile of a constable’s star. They tell criminals to reach for the sky, invariably drawing faster than their imaginary foes. It is humanity at its most animalistic, for our youthful fantasies are of the inherent elegance of violence as a tool. As children, we do not crave mediation or witticism. We crave solution. We crave gratification. It is this desire for simplicity in a world where so much is beyond our understanding that draws us to the simple comforts of professional wrestling. We see our heroes endlessly confronted with insurmountable odds and nefarious schemes and their solution is fantastically enviable: they punch and they kick and they never lose faith in the size of their heart and the strength in their right hand. More often than not, we live in a world without a lawless frontier, and thus we create our own, a place for battles to be settled in a way that some reptilian part of brain tells us they need to be settled. The outcome is never in doubt, even when it looks dire, for it is an inevitability that our heroes stand tall. The sun no longer sets, but the television screen fades to black while the camera is fixed upon a man with his hands held high. 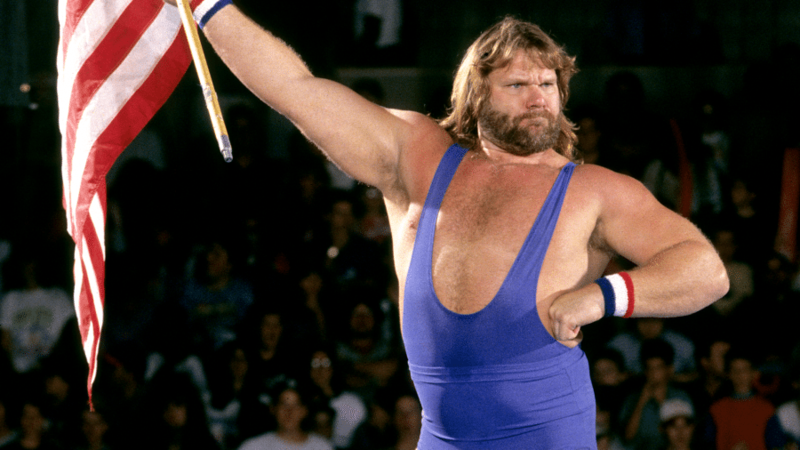 Perhaps it was this base need to be the conquering hero that attracted Jim Duggan to professional wrestling. After football took him to college and his body failed him the NFL, he made some connections in wrestling and made the same switch that many had done before. Football players share a trait with wrestlers that generally makes the transition seamless: a desire for contact, or at least an indifference toward imminent pain. As many had done before, he took to the physical aspects of wrestling, but Duggan was special in other ways. The same charisma that made him an obvious choice as a team captain in football came through in his wrestling as well, and crowds were enamored almost immediately, showering him with praise, thrilled to be a part of the beginnings of a promising career. In 1984, Duggan was proclaimed the Mid South athlete of the year, an honor he accepted in the middle of the ring with the solemnity you’d normally see of someone taking office. As a prize, he received a pair of Lucien Piccard cufflinks. To Ted DiBiase, these cufflinks were not simply a prize given to the wrong man, they were the latest indignity in a life full of being passed over for lesser performers. Originally a tag partner with Duggan, he had turned his back and aligned with Skandar Akbar at the promise of money and success. While he won his matches and even the North American title, he was still seemingly fueled by petty professional jealousies; soon after Duggan won his award, DiBiase talked at length about how he was not only the true Athlete of the Year, but how Duggan was a classless fool, and the cufflinks were forever wasted on him. In the weeks that would follow, each man would come to the ring dressed in their finest tuxedo in an attempt to prove their class and claim. In an in ring competition of “best dressed” Duggan won overwhelmingly (via fan participation), leading an incredulous DiBiase to request an electronic monitoring system of the fans cheering, only to be hoisted by his own petard. Finally casting aside the false air of sophistication, he reacts honestly to his loss and it is both heartbreaking and frightening: he threatens Joel Watts and takes a lead pipe to Jim Duggan’s car. In these moments, DiBiase is the mirror of the avenging cowboy hero. He is faced with an event he cannot grasp, and he reacts in anger and violence but he his goals are selfish and based in ambition rather than righteousness and purity. Of course Duggan declines police involvement, and chooses to settle things the only way that he knows they will both understand. Dressed in their tuxedos, fortuitously black and white. The loser will be run out of town. Even the landscape and the architecture is different. The men are surrounded by a cage to make sure no one can possibly escape justice. One of the ring posts has been fixed with a pole going above the top the cage, even above the frame of the hard camera. From it hangs a coal miner’s glove, which can be used by whomever is able to incapacitate their opponent for long enough to get it. It looms over the proceedings like the clock waiting to strike noon in the town square. DiBiase enters second and looks like a man faced with his own mortality. He wavers and inspects the cage and stalls and whines and only gets in to the ring when the referee calls for the bell so he can start the count. DiBiase implores the referee to check Duggan for illegal objects and tries desperately for an advantage but Duggan was expectant. He wheels around and unloads, the cameras and lights leaving a trail of wondrous blue light behind the white of his jacket. Thwarted already, DiBiase retreats, diving headfirst towards the bottom rope and is confronted by steel bars. The camera catches the moment of realization which gives way to understanding and eventually fear. He begs off as Duggan shakes his head no. He is peppered with punches and thrown viciously around, paid back for the beatings he had given without receipt over the past year. Disheveled and beaten,DiBiase maintains the innate qualities that allow a man to thrive as a professional wrestler: a sense of where you are and a total disregard for the wellbeing of your fellow man. With Duggan baring down on him once again, he uses Hacksaw’s own momentum and throws him headfirst in to the same cage that kept DiBiase trapped only a few minutes before. Finally in control, Dibiase’s offense is in stark contrast to Duggan. Duggan is wildly emotional, with every successful punch representing a moral victory. DiBiase is calculating and above all petty and mean, tearing at the brilliant white suit of his foe in between every stomp and chop. Duggan has been cut and the blood has peppered his shirt, drops finding their way to his chest, a large splash on the inside of his forearm where he tried to wipe himself clean. Content to end things quickly, DiBiase is the first to climb for possession of the glove, but he is thwarted by Duggan and thrown to the ground. Enraged, he rips Duggan’s shirt over his head, trapping him in the garment. The cut again seeps through instantaneously, and Duggan looks like an overlarge child in a homemade ghost costume who has been the victim of a violent prank at the hands of a group of anonymously evil and cruel high school boys. His pain is evident through the cloth, he is dazed and bloodied, leaning on the middle rope, unsure of his surroundings. It is perhaps in these low moments, as he stares at the stark contrast of his own blood on the suit he was once so proud of, that Duggan subconsciously contemplates why he wears white, for it is the representation of his honesty and forthrightness. To wear white is to say to the spectators that you are without blemish, that you have nothing to hide. When he is tarnished, as he is now, laid low, his failures are visible and apparent. Perhaps, he thinks, it would be easier to be the man in black, to keep himself hidden, to not lay himself bare. Perhaps, as he looks up at the hundreds of lights shining down upon him, it would be easier to not care at all, or at least to only care about himself, to be governed simply by his internal desire to succeed at any cost, damn the thoughts of others. He cannot think for long, as DiBiase drops fist after fist with terrifying accuracy. Any small crisis in his faith is shaken off as he again halts DiBiase, choking him with the bloody remnants of his shirt. Bare chested, he looks animalistic and barbaric compared to his still clothed opponent, stomping and punching and whirling around, no regard for his own well-being. Fighting off a piledriver, he again is able to stop DiBiase from climbing. There is a sense he is only delaying the inevitable, but for the moment that is all that can reasonably be asked of him. And suddenly, he is alive again! Throwing combinations of punches, rights and lefts, forcing DiBiase back, another reversal of momentum. Perhaps in his rage Duggan has embraced some of his own simmering villainy, as he rips and claws at the shirt of Dibiase, repaying him in kind for the earlier damage. As DiBiase is stationary on his knees, his head bowed and bloodied, Duggan climbs and retrieves the coal miner’s glove. As Duggan approaches, DiBiase has one final trick, and throws powder in to Hacksaw’s face. The move casts his opening stalling in to a nefarious new light, as perhaps his tactics were only to get the referee, eager to start an important match, to unintentionally fail in his duties. Perhaps it is just the advantage and skill of the black clad villain, to always have something necessary hidden away for a moment when all seems lost. Stealing the glove away, he aims for Duggan’s head. Blindly, Duggan dodges, and perhaps that is simply the skill of the intrepid hero, to always have something in reserve, to always have a moment that seemingly defies what little logic governs the human spirit. His misses wildly again, and is thrown by Duggan. They collapse next to each other and they rise together. Duggan grabs at the gloved hand of DiBiase and smashes it, again and again in to the turnbuckle, eventually ripping off the weapon that he so righteously sought only minutes before. When he does so, he screams, blood pouring down his face, and he is in that moment not a pro wrestler or a cowboy or an avenging hero, but a gladiator on some ancient battlefield, going berserk, sure of only his own immortality and legend. When DiBiase is finally leveled, he lay unconscious, his body shaking and shuddering with each breath as Duggan reaches in celebration toward the heavens, his arms outstretched and his back arched. It is these moments, the ones after victory, which truly differentiate the heroic. Duggan, as the faceless ring announcer exalts his name and the crowd chants it over and over in awed and reverent tones, does not celebrate his own accomplishment, but instead points to his public. He smiles and gives a thumbs up, for he knows that part of his persona is inextricably tied to the power he derives from sympathy. It is the people he proudly fought for, and not himself, for even as DiBiase’s petty attacks were focused on him, his reason for fighting was to rid his fans of the ugly presence of his opponent. He does not ask for thanks, only for the opportunity to call upon their strength when they are both in need. He does not ride off into the sunset, but the crowd is still cheering as the screen fades to black and he walks up the ramp. NextVOW Flagship: Elimination Chamber, Deserving Titles, New Beginning & more!